Different people are stimulated to be creative in different ways. Sometimes it can be useful to explore which conditions we each prefer. Some people like to start with a blank piece of paper. They can then decide from scratch what they want to create. This sounds alluring, but it can lead to paralysis. 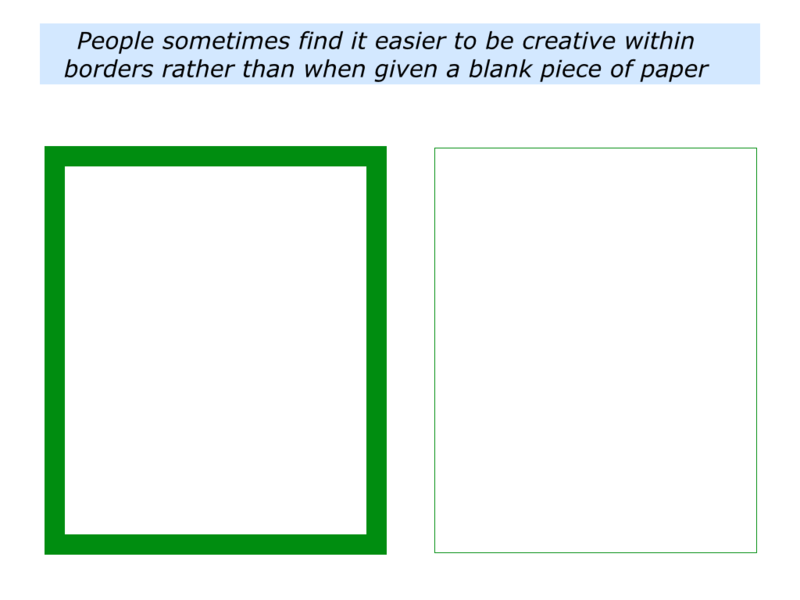 A person may find it takes a long time to decide what they actually want to create on the blank piece of paper. The results they are asked to deliver. The resources available for delivering the results. The time limits within which they must deliver the results. Borders can also provide stimulation. Having such limits forces people to use their imagination to find creative solutions to challenges. 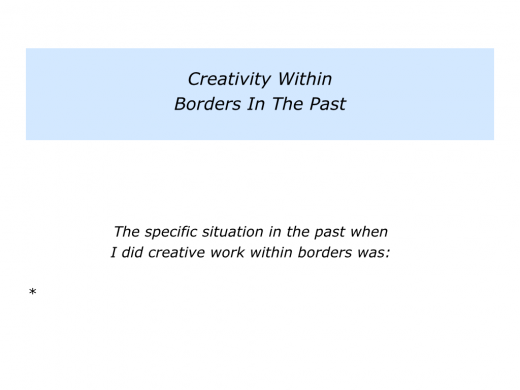 Looking back on your own life, can you recall a situation when you were creative within borders? You may have pursued this route when writing an article, renovating a house, tackling a crisis or whatever. What were the results you were expected to deliver? What resources did you have available? 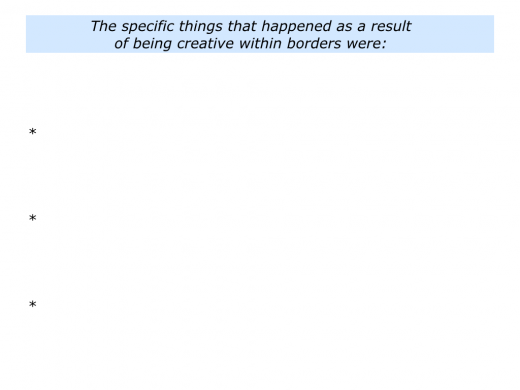 How did you find creative solutions within the limits? 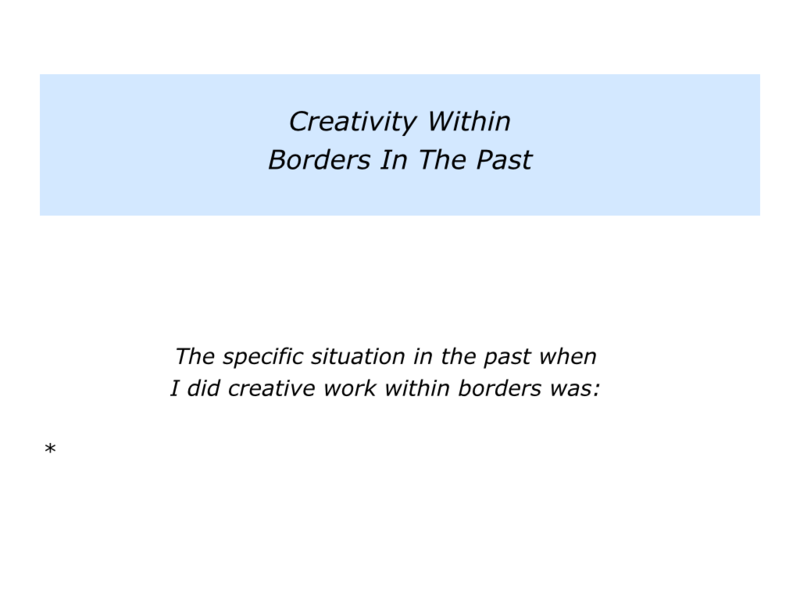 Describe a specific situation in the past when you did creative work within borders. 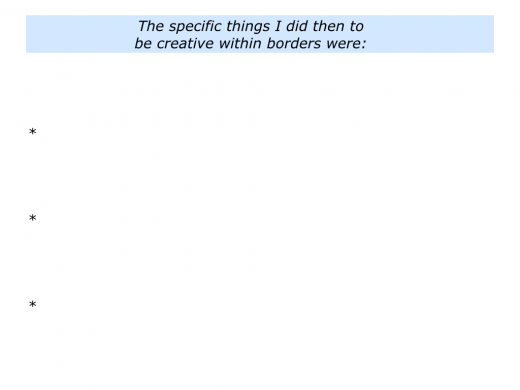 Describe the specific things you did to do the creative work. 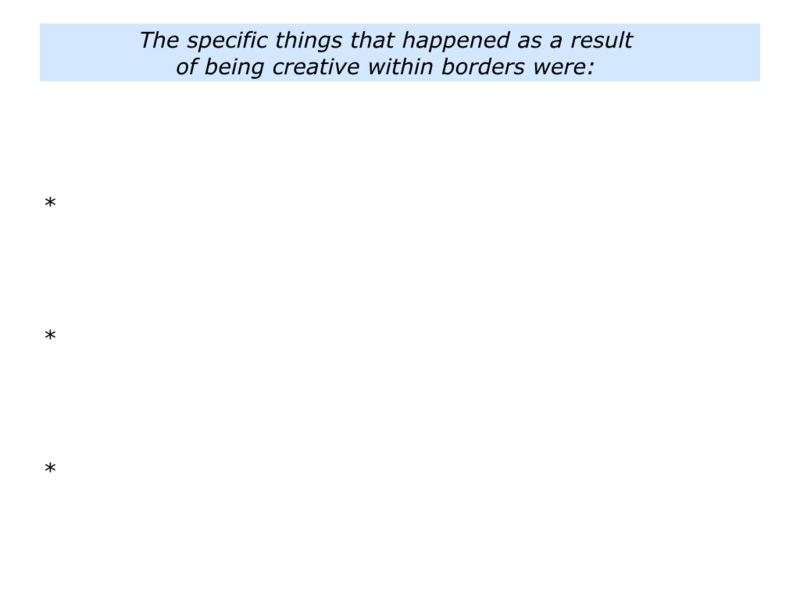 Describe the specific things that happened as a result of doing the creative work within borders. 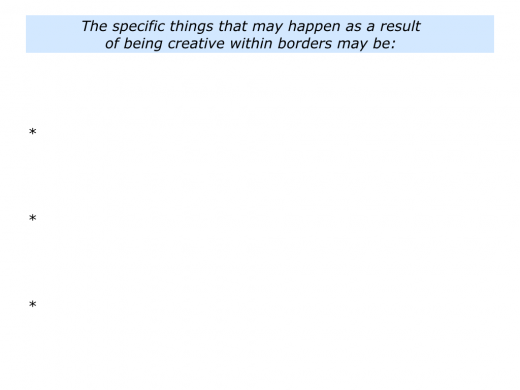 Look around the web and you will see many articles about creativity within constraints. David Sturt, Executive Vice President at O.C. Tanner, described this approach in an article he wrote for Forbes called Creativity: How Constraints Drive Genius. Here is an extract from the article which you can find via the following link. If you ask Architect Frank Gehry, best known for building the Guggenheim Museum in Bilbao, Spain, and the Disney Concert Hall in Los Angeles, what really inspires his work, he may give you an unexpected answer: limitations and constraints. Contrary to the way most of us think about creativity and Great Work – that it’s a product of free-thinking, no rules, and unlimited options – Gehry’s comments confirm a finding that we didn’t expect when we began culling through data collected from our study of award winning work from 1.7 million people. Basically, we found that people who create new value on the job are often inspired by their constraints. Karen Hough underlined this approach in an article she wrote called Creative Constraint: Why Tighter Boundaries Propel Greater Results. Below is an extract from the article. You can read more via the following link. When there are no boundaries, the possibilities may seem too large. That’s why some of the greatest art and innovation has come from a situation of constraint. Human beings have many possibilities, but they also have limits. Every person has strengths, but they also have weaknesses. Every human being also has a limit in terms how long they will live. Let’s return to your own life and work. 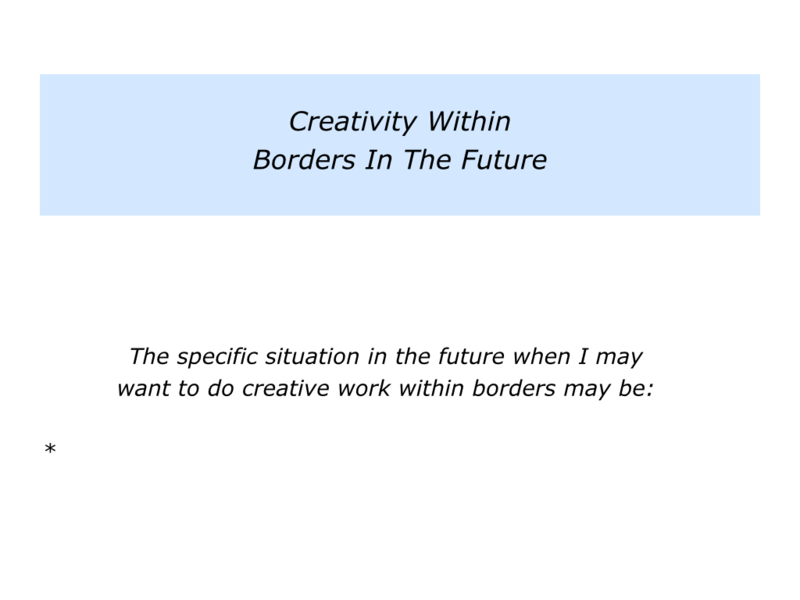 Looking ahead, can you think of a situation in the future when you may want to be creative within borders? This could be in your personal or professional life. You may want to pursue a passion, embark on a project, tackle a specific challenge or whatever. How can you be creative within the limits? Describe a specific situation in the future when you may want to do creative work within borders. 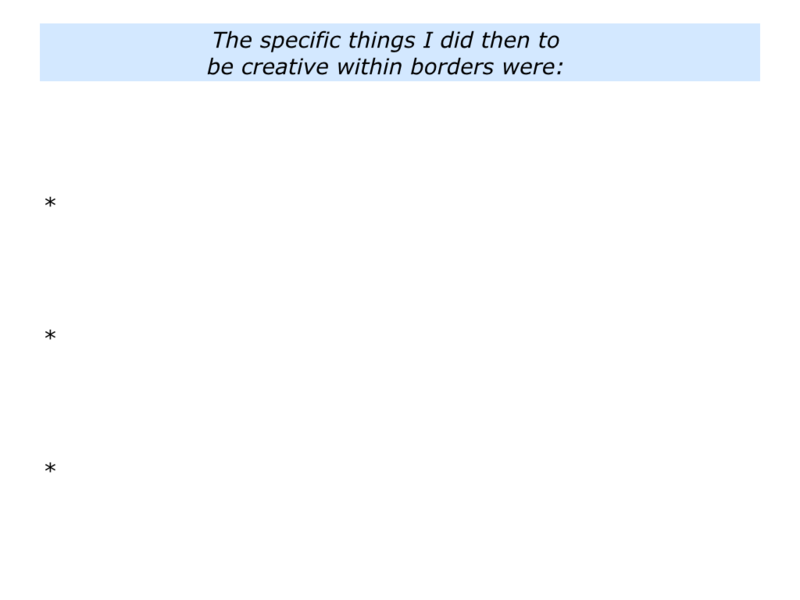 Describe the specific things you can do to be creative within the borders. 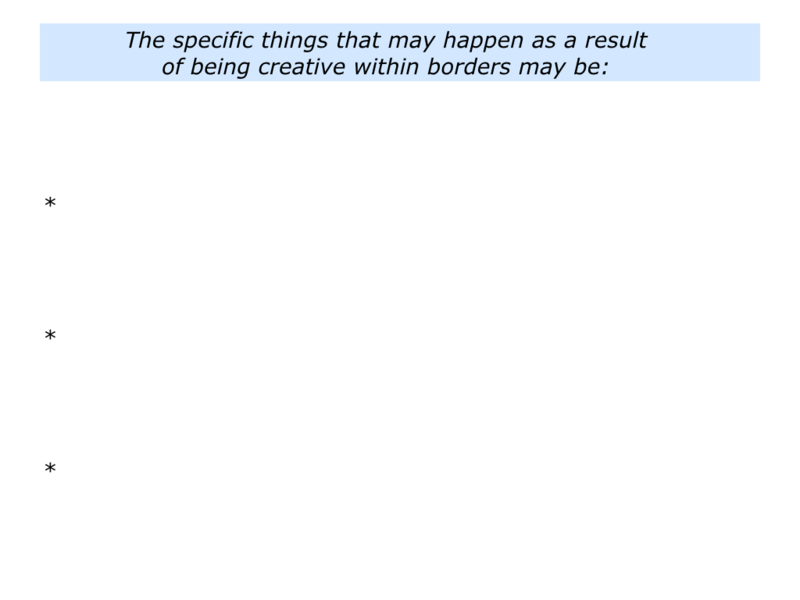 Describe the specific things that may happen as a result of being creative within the borders.